Microsoft's Surface tablet, unveiled by CEO Steve Ballmer at a press event, was designed in secret over the past several years. Click here for a closer look at the Surface. LOS ANGELES (CNNMoney) -- Upending one of the world's most successful business strategies over the past three decades, Microsoft has developed a Windows tablet computer of its own design. The company on Monday unveiled the Surface, a PC tablet that runs a yet-to-be released version of its Windows operating system called Windows 8. The device is the first commercial PC that Microsoft has directly designed and sold. The tablet features many of the now-standard tablet specs, including a 10.6 inch high-definition touchscreen and front and rear facing cameras, which all fit into a 9.3 millimeter, 1.5-pound frame. Microsoft is recycling -- or extending -- a brand name it has used before. The first "Microsoft Surface" device, which began shipping in in 2008, was a giant touchscreen computer aimed at retailers and other commercial customers. Microsoft's Surface tablet will first be available on a version of Windows 8 called Windows RT. That operating system will run on microchips designed by ARM (ARMH), which are inside 95% of the world's smartphones and tablets. 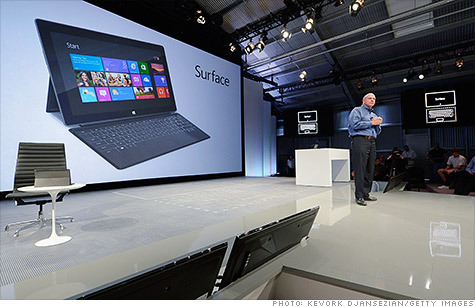 Another version of Surface will be designed for the fuller Windows 8 operating system, which will run on Intel chips. Microsoft didn't give specifics, but the company said the Windows RT version will be available sometime this fall in 32- and 64-gigabyte versions and will be priced "comparably" to other tablets on the market. Apple's most basic version of the iPad retails for $499. The full Windows 8 version will be available three months later in 64- and 128-GB versions. Microsoft plans to set its price point in the same zone as ultrabooks, which typically run around $1,000. Microsoft (MSFT, Fortune 500) said it will not be the exclusive manufacturer of Windows tablets. Still, it's a radical shift for the world's largest software company. Microsoft's licensing of Windows to PC manufacturers has been one of the most profitable businesses in technology history. The software giant's Windows division posted sales of $4.6 billion last quarter, $3 billion of which was pure profit. Microsoft's 33% profit margin was the sixth largest on the latest Fortune 500 list. It's a strategy that is both lucrative and dominant. Windows is the operating system running on more than 90% of the world's computers and two-thirds of the planet's Internet-connected gadgets. A move to shake up a model that successful would usually be considered a mistake. But these aren't ordinary times. Apple's (AAPL, Fortune 500) iPad has been luring away Windows customers for two years. PC sales have flat-lined as consumers look to buy a more elegant, portable and simpler device for their everyday computing needs. Windows sales have fallen in five of the past six quarters. Though Microsoft's "open" strategy, which lets consumers buy Windows on a wide range of devices, has been a winning tactic for decades, Apple's "we make the whole widget" plan has been far more successful over the past several years. Apple's iPad revenue has surpassed Microsoft's Windows revenue for the past three quarters. Apple's stock market value eclipsed Microsoft's in May 2010, and the company -- the world's most valuable -- is now worth more than twice as much as its one-time archrival. As a result, Microsoft is taking a page from Apple's handbook. "Microsoft founders Bill Gates and Paul Allen made a big bet -- a bet on software -- but it was always clear that we had to push hardware in ways that sometimes manufacturers hadn't envisioned," Microsoft CEO Steve Ballmer said at Monday's event. "We believe that any intersection between human and machine can be made better when all aspects, hardware and software, are working together." It's not the only one looking to mirror Apple's strategy. Google (GOOG, Fortune 500) last month completed a blockbuster $12.5 billion purchase of Motorola Mobility, expanding its role as the designer of the Android operating system to also become a smartphone maker. That's a hard path. Hewlett-Packard's (HPQ, Fortune 500) TouchPad tablet lasted all of a month on the market. Research In Motion's (RIMM) BlackBerry PlayBook tablet also never took off, despite a steep price cut. Microsoft also has a very mixed track record when it comes to making gadgets. The software giant has actually been in the hardware business for 30 years, making mostly mice and keyboards. But in 2001, the company expanded into the video game sphere, losing billions on its Xbox console before it just recently took over the top spot on the market. Its Kinect accessory, which makes controllerless gaming possible, has been a great success story. But the Zune MP3 player never gained much traction, and Microsoft announced earlier this month that it would kill off the brand completely. It retired the Zune hardware last fall.